Jessica Alba led the style pack at the Who What Wear x Target launch party held at ArtBeam in New York City on Wednesday. She appeared alongside Kate Bosworth and Jaime King as they were given the first look at the collection that features street-style inspired clothing and accessories, all priced under $50. The 34-year-old actress showcased a few pieces from the collaboration, donning a $19.99 black-and-white striped tee, a $44.99 black moto jacket and a $27.99 vintage-looking floral pencil skirt in yellow and blue. Jessica amped up the glamorous edge of the look by accessorizing with spiked earrings, a couple of rings, a bangle and a pair of silver pumps. Her makeup was kept in neutral tones, and her brunette tresses were worn down in tousled waves to complete her effortlessly chic look. Jessica chose a pair of Brian Atwood “Marella” pumps for her feet. They are from the designer’s fall 2014 collection and feature mirrored silver leather, pointed toes and sleek 4.7-inch heels. 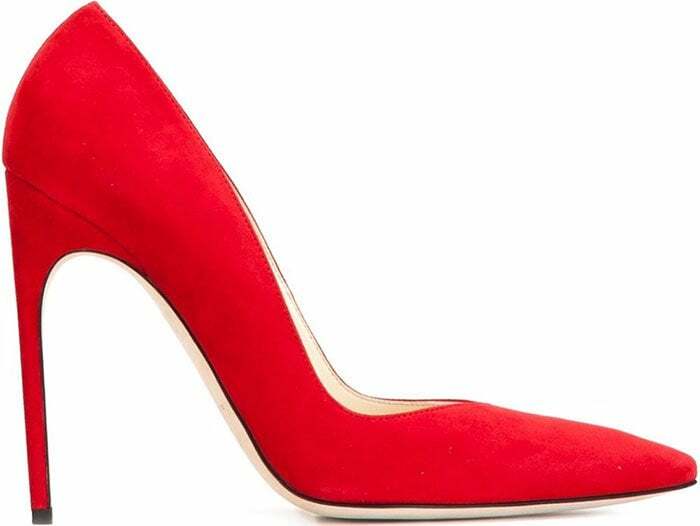 A version of these Brian Atwood pumps in red suede can be purchased at Farfetch.